To mark anti-bullying week (14-18 November) this week’s guest blog is from Claire Shenton, Senior Research Officer on Children’s Wellbeing at the Office for National Statistics (ONS), Larissa Pople, Senior Researcher at The Children’s Society, and Gwyther Rees, an Honorary Research Fellow at the Social Policy Research Unit, University of York and one of the principal investigators of the Children’s Worlds project. 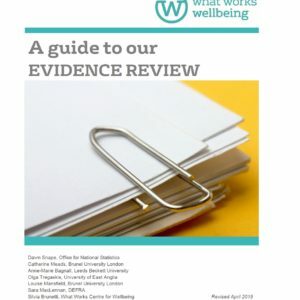 The Children’s Society and the University of York have been collaborating on the programme of research on children’s subjective well-being discussed in this post for over a decade. The long-term impact of bullying is something that Children’s Society and ONS monitors regularly as part of the Good Childhood Report and the Children’s Measures of National Wellbeing. The Children’s Worlds study provides an international context within which to understand the relative size and scope of the problem here compared to other areas of the world. 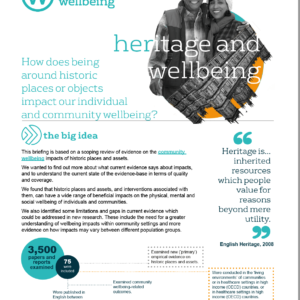 The What Works Centre for Wellbeing are also looking at wellbeing over the life course using longitudinal data to track how wellbeing in childhood relates to outcomes in adulthood. Their findings will be published within the next year. Childhood bullying is a topic that is sometimes trivialised. But research, alongside evidence from longitudinal studies, shows that bullying needs to be taken seriously. As part of National Anti-Bullying Week (14-18 November), ONS and The Children’s Society give an overview of some of their analyses on bullying in both a national and international context. Estimates from ONS, based on 2013 to 2014 Understanding Society data suggest that around 12% of children in the UK aged 10-15 have been bullied at school (either physically, in other ways, or both). ONS analysis found that there was no difference in the estimated overall prevalence between boys and girls and that there was no change in the prevalence overall between 2009-2010 and 2013-2014. The Children’s Worlds study looks at bullying in more detail in an international context, drawing a distinction between physical bullying and being left out by other children (also known as ‘relational bullying’). Compared to the 15 other countries included in the Children’s Worlds study, England is ‘fairly average’ for the prevalence of physical bullying, but has the highest incidence of all participating countries of relational bullying, with 50% of children reporting being left out by other children. The issue particularly affects girls in England who were 40% more likely to experience this type of bullying than boys. Being bullied has a profound effect on children’s well-being – it can affect a child’s sense of self-worth, disrupt their education and potentially lead to mental ill-health. The Children’s Society found that children who had been bullied frequently were six times as likely to experience low subjective well-being (36%) as those who had never been bullied (6%). 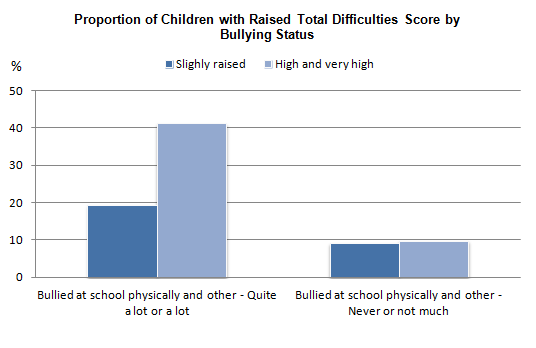 ONS also used Understanding Society data to look at the relationship between bullying and children’s mental ill-health. In 2013-14, children who were bullied frequently were over 4 times more likely to report highly on a measure of mental health difficulties (41%) than those who were bullied less frequently or not at all (10%). Experience of bullying appears to also have a bigger impact on children’s well-being than many issues that usually concern policy makers. According to analysis by The Children’s Society, recent experiences of bullying accounts for as much of the differences in subjective well-being between children as a range of personal and family characteristics combined, including poverty, family structure, disability, ethnicity, age and gender. The effects of bullying can have long-lasting negative implications for individuals and society. Longitudinal research which follows the same people throughout their lives shows that the effects of childhood bullying can last well into adulthood. Retirement and wellbeing: what works?